The numbers are alarming and disappointing, to say the least. 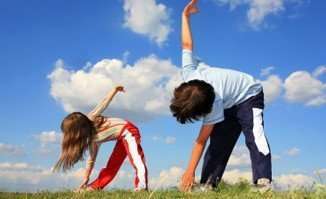 Canadian children get an F in the 2011 Active Healthy Kids report card on physical activity for the 5th year in a row. Truly disturbing, but not entirely shocking frankly. The report found that, “kids are sedentary 59 per cent of the time between 3 and 6 p.m., getting only 14 minutes of moderate-to-vigorous physical activity.” Again, sad but not surprising. In our frenetic world of mostly double income households, two parents working outside the home, electronic entertainment devices of all shapes, sizes and skill levels and paranoia over free play — do we really have to wonder? Of course it is challenging to overcome any one of the obstacles listed above. But, it is WORTH the effort. 2. Re-instate electronic gaming devices, on a schedule, after school on Friday and during the weekend. Limit use to 30 minutes in one sitting and likely 60 minutes per day. 3. Strategically place tv remotes in non visible areas. AKA — Hide them. (Again, after the initial shock, they will not know they are missing.) This can apply to the time after school, before dinner and until homework is complete. In other words, remotes appear after dinner and homework, if desired. 4. Open the front door or the back door and let them go out and play for at least 60 minutes after school. 5. If picking up after school, let them run around in the yard with their friends before taking them home. 6. Go out for a walk after dinner (except in bone-chilling cold or during torrential rain). Reacquaint yourself with the park. 7. Walk to and from school. 8. Go for a family bike ride after dinner. 9. If accompanying a child to an activity, take other child/children for a walk around the block, inside the arena, or up and down stairs. 10. Pack a fruit snack in their bag for after school on the bus or on the way home. Or have a plate of sliced up fruit or veggies and dip waiting for them when they walk in ravenous after school. 11. Walk away from the frozen food section of the grocery store and the processed food aisles. You can do it. Certainly not brain surgery, but tried and true methods that work with children of all ages. It may take some getting used to but persistence pays off for both parent and child. It has moved way past being an option. It is a SERIOUS HEALTH issue that's costing us lives and money. And any way — do you know a kid or a parent who would accept an F on any report card? Kelly Murumets, President and CEO of Participaction, shares more simple tips on how parents and kids can improve their physical activity and fitness levels.